Getting clients for a business can be tough. You spend hours researching and pitching, only to get continually rejected. Running this design agency, I have had my fair share of rejections and hours of outreach. But, I’ve been able to land of bunch of great work, including for Neil Patel and GoDaddy. And guess what? You can, too. I’m going to show you exactly how to land high paying clients, step by step. I’ll be lending you my personal experience with getting clients for web design, writing, consulting, and more. As well, I’ve compiled expert advice and case studies for many other industries. Enjoy getting more clients after reading this! Do you know how to build websites? Then you have a superpower you shouldn’t waste. People will pay a premium for a great website that helps their business generate more results. Whether that be e-commerce sales or more clients. Right now, almost 60% of small to medium sized businesses say that a website is at the top of their list for investments. The amount of money you can make from designing websites is absurd. A single site can be worth thousands to tens of thousands of dollars or more! Yes, businesses will pay that much. Think about it like this. If you design their website for $5,000 and they earn $20,000 more over the next year because of it, that’s a 4x return on investment. Okay, on to the fun stuff now, which is how to get web design clients. 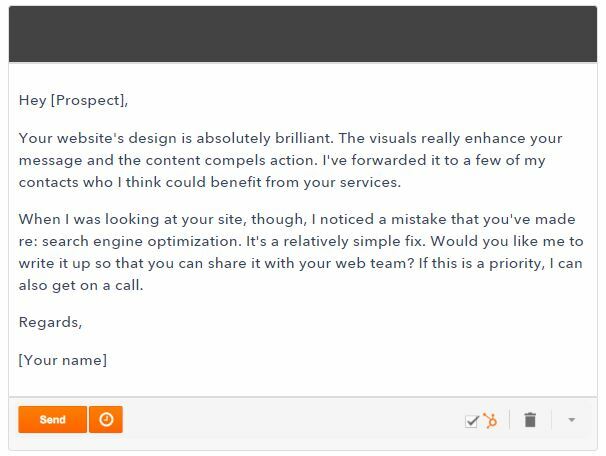 Cold calling for web design clients is a thing of the past. There’s way more effective tactics for getting clients and this is one of my favorites. I’ve been taking advantage of this myself with great success lately. Partnership marketing is a seriously untapped source for getting clients. It’s a simple idea, too. Partner with other businesses to have leads referred to your agency. If they convert to a client, you pay your partner a percentage or set amount. For the company your partnering with, they only have to spend a few minutes of their time to potentially earn thousands from referring a converting lead. The best part about it? You don’t have to worry about client acquisition. Would you agree that designing websites is the easy part and getting clients is the hart part? Me too. For those researching how to get local web design clients, this may be one of the best indirect ways to do so. Alright, so how do you do this? Research, research, research. Then pitch, of course. Here’s how I’ve done it and I recommend you begin. This will display business directories we’re going to sift through to find potential partners. I’m going to take a look at 411, a directory that I love for using this method. Since we’re trying to get web design clients, we want to partner with B2B companies that don’t offer our service. This way, it makes more sense for them to refer leads to us, otherwise they’d do it themselves. Some of the categories I point out below are good choices. Select a category and search for businesses that have websites. You could call them over the phone if you’d like, though. Personally, I prefer email to deliver a concise message and to be more time efficient. But to get their email, you need to visit their website first, duh! Scan for an about page or look in the footer. You should be able to find an email or contact form. Once you, it’s go time. My name is X, I own a web design agency in Your City. I wanted to propose a partnership that would be equally prosperous for both of us. The general idea is that you would refer leads to my agency which could benefit from my services. If they convert to a paying client, you will earn a percentage of the project. I’d love to hammer out the details. Let me know if this sounds like something you’re interested in. You’ll be surprised how many companies will be interested in this kind of partnership. Think about how smart it is for both parties. You get to avoid the whole boring and tedious acquisition process. And, they get to provide more value to their existing client base while earning more revenue. Some will want to speak over the phone, create a contract, or even meet in person. Go with the flow and take advantage of these opportunities, no matter what. Imagine having several partners sending you clients every month, that could equal to ten’s of thousands of dollars! This is a very unique strategy for getting web design clients. I was very surprised I hadn’t heard about it more. Providing value before asking is one of the most powerful tools in your arsenal. Preparing a mockup site, or doing some industry/keyword research can go a long way to show that you truly want to help their business. With local companies getting so many generic email blasts, focusing on depth instead of breadth with client pitches can have a huge impact on your conversion rate. The premise of this method is to research prospects that have outdated websites, make a demo of an updated version, and give them the link. Instead of just a regular pitch, they get to scroll and click around a live website. It can send them over the edge and make them realize how much they need a new website. The best part? Most of it’s done already. With some tweaks and work, the demo can be pushed live. There are designers which have a double digit conversion rate with this strategy. It’s very effective. Just check out this thread from Reddit. This guy gets upwards to a 75% close rate! First, you need to find potential clients. A.K.A, old websites. I’m going to visit another local business directory for this strategy. Businesses from where you are will be more likely to trust you if you’re established locally. Snooping around the construction and renovation section, I find a home security company. Visiting their website, I see the following. If you’re a website designer, you probably cringed a bit. Don’t worry, I did too. With an outdated target in my view, it’s time to make a subdomain. This subdomain will be the name of their business. To do this, you will require web hosting, which I’m sure you’re familiar with as a designer. Pulling this method off requires hosting that offers subdomains, preferably unlimited because you’ll be pitching many clients with this tactic. Using cPanel, I can navigate to the subdomain section and add one in a single click. Then it’s time to install WordPress. You can use whatever CMS you’re familiar with or code it from scratch if you’re nerdy like that. To save time and because it’s my specialty, I’ll create a WordPress installation. With my hosting, I can also do that in a single click. See how streamlined this process is? Obviously you know how to design a website so I’ll skip showing you that part. The key is to insert their information on the demo, so it literally becomes an updated version of it. Here’s what I made. How clean that does look? You can’t tell me that they wouldn’t be impressed upon seeing it. The demo doesn’t have to be completely fleshed out. I usually just do the home page. The navigation and certain buttons won’t work, it’s a demo after all. When you’ve finished it, use your standard pitch and include a link to the subdomain. Many clients will be blown away by this as so few designers take this approach. Normally, service providers and businesses try to find the customer and go to them. Think PPC, billboards, newspapers, and similar advertising strategies. It’s all about having the customer come to you now. 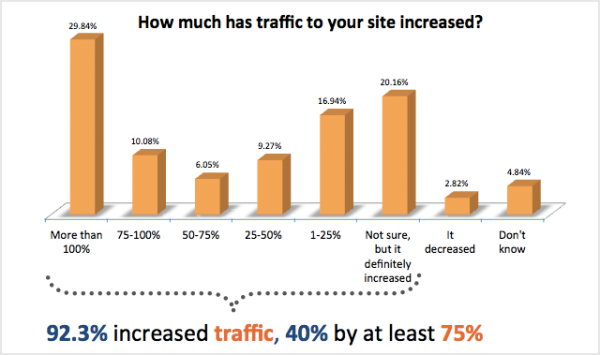 93% of companies that use inbound marketing have increased their traffic. 75% of them increased it by at least 45%. That’s incredible! 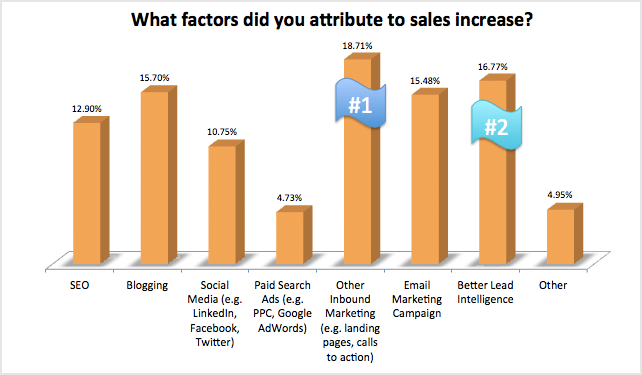 From the same study, guess what strategy attributed the most to sales? You guessed it, in bound marketing. There are four phases to inbound marketing, comprising of the following. You need to attract high quality leads to your website that can convert to paying customers. This is where content marketing comes into play. Offering free value like this is one of the best ways to ramp up organic traffic. The best way to do so? You should be blogging on a regular basis, whether it’s once per week or more often. The more you blog, the better. This improves your SEO and gives readers more content to enjoy. Writing about just anything won’t work, though. Content needs to bring in the exact kind of customer you want. 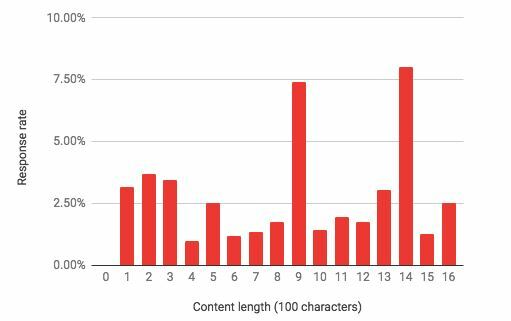 Research keywords that are related to what you sell and include these in your posts. That way, you attract the right kind of visitor. It’s wise to build a customer persona to craft your content around, too. Here’s an example from Templates Data. Even if you’re just starting out and don’t know much about your customers, you can still do this. I’ll tell you how. I was reading a book once called The $100 Startup by Chris Guillebeau. Great book for entrepreneurs, highly recommend it. You don’t need cold hard data to think about these things, just a bit of emotional intelligence. As you begin to collect data and gain customers, you can refine the customer persona to be more accurate. Think of it as a base to work off of until then. Along with regular blogging, get your social media game in shape. Share your ideas and latest articles. Engage in conversations, follow other users, and be a part of the community. People go onto social media to, obviously, be social. In the world of bots and automation, your brand will be a breath of fresh air. After you begin attracting visitors, it’s time to convert them. You might not be necessarily able to convert them into a sale immediately, so it’s better to warm them up. This helps you build a relationship with users and to teach them more about your business. Forms are a great way to start. Place email newsletter forms on the home page of your website and in individual posts. Better yet, offer an incentive for users to sign up. A free e-book works very well. On articles, you can exchange a checklist or summary for doing so. You might have all of these users coming to your site, but you need to keep them! Don’t let them slip through your fingers. They’ve come to your website, you captured their email, and now it’s time to make the sale. To do so, you can send out emails that promote your service. The key is to speak in their language. As a web designer, you might throw around terms such as “mobile responsive” and “user experience”. Many clients won’t really know what these mean or care that much. But, if you said “Hey, I’ll make you more money”, they’ll listen. After you start getting customers, it doesn’t end there. You want to create loyal fans that will promote your business for you. To do this, you should create conversations with them. Email and follow up to ask about their progress. Offer to give them a free month of maintenance or analytics. Something to show that you care. Some even create a private forum of Facebook page that only their customers have access to. The idea is to go above and beyond after you’ve provided a service. They will be more likely to refer other customers to you and talk about your business. I recommend diving into material from Marketo or Hubspot to learn more about inbound marketing. Writing is an art form. Anyone can start typing away or pick up a pen, but few can make a huge impact with their words. If you can learn how to generate traffic and sales with your writing, you’re sitting on a goldmine. This can come in many forms. Blog posts are the first that come to mind and I do them 90% of the time. E-books, newsletters, and white papers are other content which clients may ask for. But, learning how to get more clients for content writing is a skill in itself. So many writers jump into the freelance world or create an agency, only to find difficulty in landing their first client. It isn’t as easy as it seems, take it from me. But, it doesn’t have to be overly difficult, either. Here’s what I did to land writing clients. There are dozens of writing job boards across the internet with clients waiting to pay you. You just have to visit them and apply. I recommend choosing a few and creating a schedule, such as every other day, to check them for new gigs. I’ve spoken with business owners that source their content to boards like these. Want to know the truth? 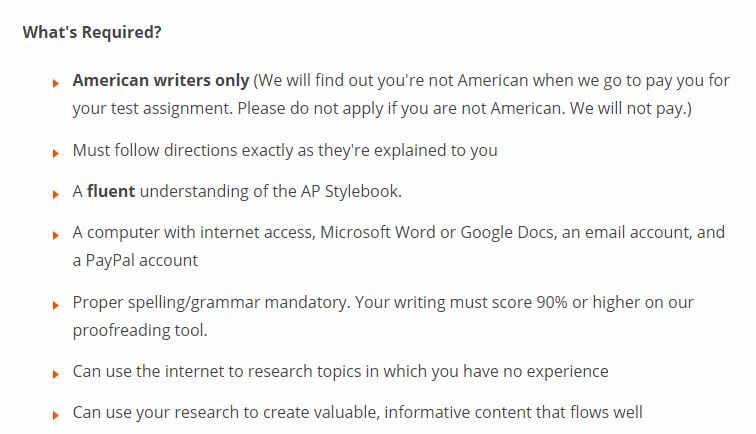 Most people applying don’t have a portfolio or aren’t native English speakers. Assuming that you have a portfolio and are a native English speaker, you’ll stand out like a sore thumb. So, let’s get onto the boards you need to be applying to. The most popular writing job board out there. I still check it from time to time as high profile clients use it. There are new opportunities posted on a daily basis. From the list of gigs, you can see the company that posted, what they are looking for, the gig type, and date. Upon clicking a listing, it will display all of the information you need to know about applying. Read carefully. Some listings will require you to attach a resume or samples. You don’t want to skip these steps. When you’ve done this, hit the apply button! While not updated as often as ProBlogger, this is an awesome job board to peep every now and then. The opportunities are medium quality I would say, based off of using it for many months. The UI is simple and the listings are easy to read. Unlike Pro Blogger, there isn’t an application form and button to submit. Listings will typically include an email you an send your pitch to. Or, they may include a link to a form on their company website. A great website to find full time work or clients. I’ve applied to jobs on Angel List in the past and it didn’t work out. But, you know what? Some liked my portfolio and previous work so much that they would still work with me freelance. So I didn’t get the job, but I still kind of got the job. If that makes sense. The point is, even if you don’t land the position, I’ve found that many companies will still send you work or keep your information for later. When you browse for a job, you can filter it down so you get the perfect results. I like to include the keywords “content writer” and “remote ok” since it’s the standard lingo on Angel List. You can expand each job listing to read more about the position, pay, and the company. If you’re interested in applying, just click the “Apply Now” button and send a message to them. 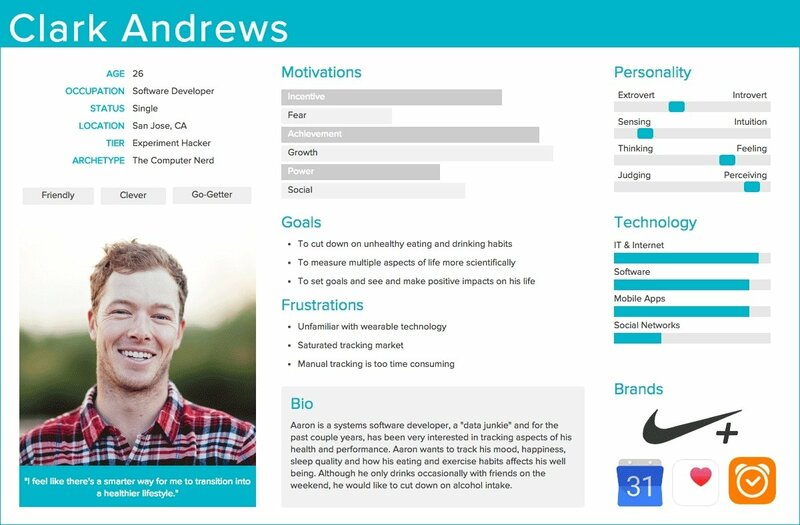 When applying, companies will check out your profile to ensure that you’re a good candidate. This means you need to fill it out with great information. Use a professional profile picture. If you don’t have one, hire a photographer to take some pictures of you. Everyone has a personal brand and a good photo improves your image. Next, create a tagline that highlights your skills and achievements. In my case, I state that I’m a writer and include some impressive names I’ve worked with. Social proof is huge. Add links to your own portfolio and social media, as well. 88% of HR professionals are more likely to hire someone that has a portfolio to show off previous work. 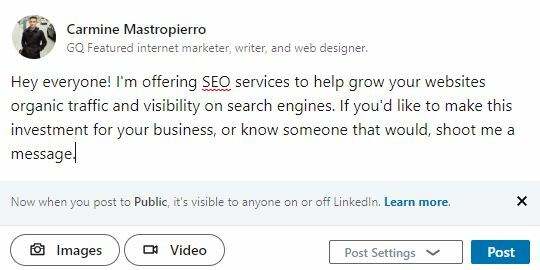 Under the services you offer, add an hourly rate, relevant tags, and elaborate on why companies should work with you. After this, it’s time to add work experience. Select your role and add the company. Choose how long you worked there and elaborate on the position you had. Include any achievements or milestones that you helped the business accomplish. Filling out your profile past this is straight forward. Add information about your education, skills, and references. Make it thorough. You want to stand out among other people applying. There’s a sub-Reddit for everything. And, as you could guess, there’s sections for writers. I’ve snagged some great clients from Reddit myself and it’s a passive approach to doing so. You just make a thread and you can have people contacting you in no time. They all have their own individual rules to follow so read the sidebars. 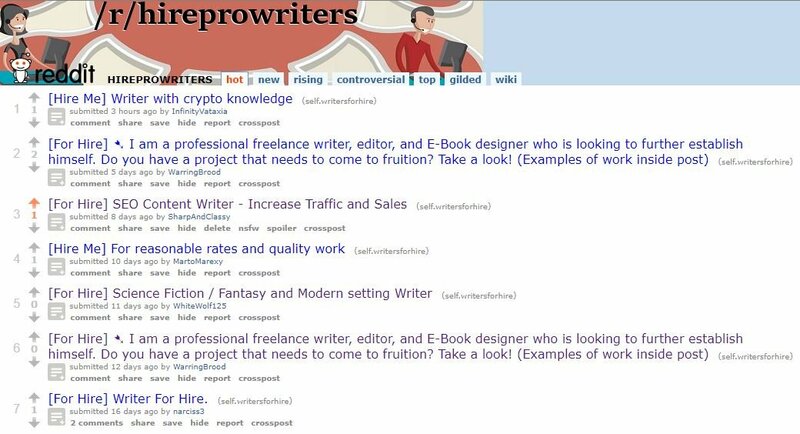 /r/forhire for example, only allows you to post once per week. I’ll give you a breakdown on my own post from one of these sub-reddits. The first thing to note is the title. I mention some recognizable names of people I’ve written for to stand out. You can tell I’m not an active Reddit user based off of my formatting. Don’t judge me. I state my standard rate and mention the topics I’m confident writing about. I link to some examples, to my portfolio, and also mention how I would like to be contacted. Post in a few of the sub-Reddits and I guarantee you’ll have some people knocking on your door. Dominate with SEO has shown us that spending on search engine marketing is continually rising. More and more companies are realizing the importance of SEO and how it can grow their business organically. If you offer SEO services, you’re probably grinning ear to ear. With the increase in spending and interest, there’s never been more opportunities on the table than now. But, how to get SEO clients is the millionaire dollar question. I’m going to show you how. So, you want to get SEO clients without cold calling, huh? I don’t blame you. Take this into consideration. Is there anything more ironic than an SEO company that’s ranking highly in the search engines? Put yourself in your client’s shoes. You’re searching for an SEO agency and begin searching Google for local companies that offer SEO services. You pop up as one of the first results. Not only will this drive more traffic to your website, it shows you actually know your stuff. Here’s what I recommend doing. Use Google’s keyword planner to research a few local keywords. Enter something like “Your city + SEO”. Write a few of these down. “SEO company”, “SEO agency” and “SEO services” are great choices. Now, you’ll want to place them on various pages and content around your website. The title tag and meta description of your homepage are essential. If you use WordPress, I recommend that you install the Yoast plugin to edit this information on the fly. When it’s activated, navigate to any page and scroll down to the Yoast section. Select “Edit snippet”. For the title, use a keyword like the ones I mentioned above. “Niagara Falls Web Design” is my main one. The meta description can also include keywords. While it doesn’t help with rankings, they are highlighted and can increase click-through rate. Referral leads convert 30% more than traditional clients. Word of mouth is powerful. If you provide a great service, it’s common for your client to talk about it with other people. But, here’s the catch. 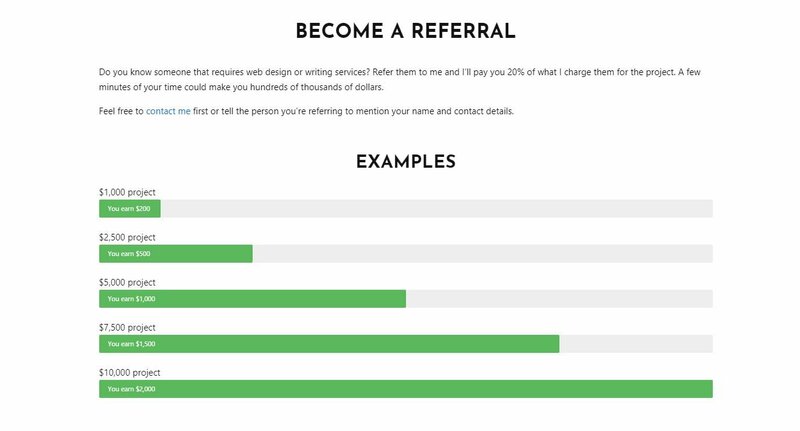 You don’t need clients to make a referral program. I even offer one here. The premise is this. If anybody refers you a client, they receive a certain percentage of what you charge them. It’s very similar to the partnership marketing I talked about earlier. Imagine that a guy named Rob has a friend named Daniel that requires SEO services. Rob emails you and gives you a heads up that Daniel might contact you soon. If he does and Daniel becomes a paying client, Rob earns a bit of commission. Here’s what my referral page looks like. I included the visual examples so users have a better grasp of how much they could be earning. 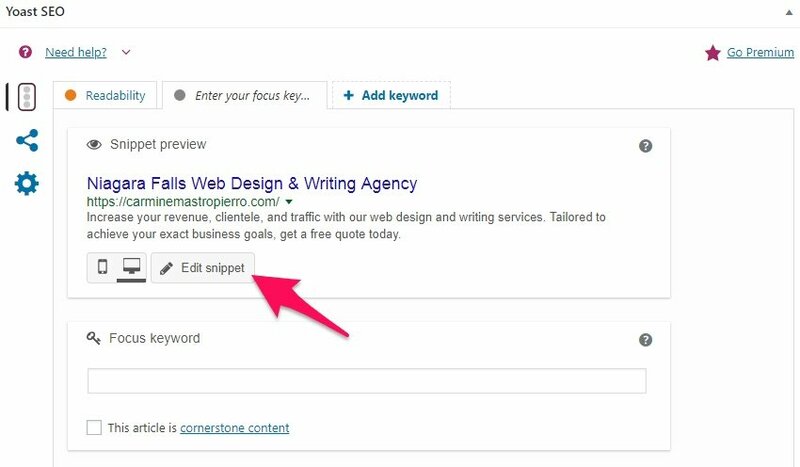 This is one of the few ways to get SEO clients fast. Most approaches take patience, but this can create results very quickly. Everyone has contacts. Family, friends, coworkers, etc. These can be great opportunities waiting to happen, you just have to be assertive. Of course, you have to let others know that you are offering SEO services to start. The best place to do so? Social media. You probably have a Facebook, Linkedin, Twitter account and more. Put them to work! Even a simple message like this could open many doors. Do you know any business or website owners specifically? If so, you could send them an email with a proposal. It’s best to ease your own into offering SEO services this way. Try meeting up for a coffee or pitching a short phone call. Nothing beats good old shaking hands and face to face networking. Did you know that almost 100% of people agree that it’s essential for good business relationships? Before you venture off to some network events, you need one very important thing. You don’t want to be the guy that’s just throwing them around, but you need to have them when a good opportunity comes about. At a networking event, you’ll inevitably hear the question “What do you do?” and it provides a great chance to talk about your SEO agency. Only if they seem interested should you give them a card and they’ll let you know. I recommend that you check out Vistaprint for getting business cards. A business card should state your name, contact information, and the services that you offer. If you want to add a bit of social proof, add names of notable clients you’ve worked with. Once you have those in your hands, you need to actually attend events. I suggest taking a look at Meetup.com for business and similar events that are going on near you. A quick search for “Career & business” displays tons of groups, some boasting tens of thousands of members. Click on a group that’s interesting and you will find when their next meetups are. It also displays how many members are attending, but it isn’t entirely accurate. I find that much more people end up going, they just don’t register on Meetup or select the attending option. Consulting can make you big bucks. It also requires very little equipment besides a telephone to begin. But, if you’ve ever tried it, you know one thing. It’s hard to get clients. If you’ve ever wondered how to get your first consulting client, I’m about to help you. 3 out 4 people suffer from anxiety when it comes to public speaking. Imagine how good of an image you’ll have in the local business community if you speak at events. While it can be a nerve-racking experience at first, it will boost your confidence and land you many clients. Learning how to promote your consulting business through presentations and talks can be a life changing skill. It creates the opportunity to mention your services and how it could help other businesses. Even if you don’t and you focus on other topics, speaking at events will get others interested in you. They will check out your social media, website, and other platforms that you use. Make sure to create a killer presentation as it makes you appear more credible and makes the talk more engaging. Slides Carnival has awesome free templates you can use to spice up your powerpoints. After a presentation, you’re bound to have other business owners asking you questions and wanting to get to know you. This is an opportune time to hand out business cards and network face to face. The key is to brainstorm what kind of events your ideal client would attend then make a pitch to the people organizing it. 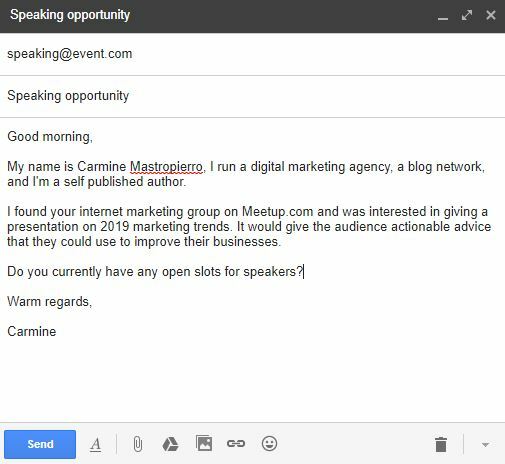 Above I mentioned Meetup, it’s a fantastic tool for not only networking, but landing speaking gigs. Search for groups related to your industry. They may have contact information for those that wish to become a speaker. If so, you’ll need to sent a great pitch. Here’s an example of what you could pitch. Another website to use for getting speaking opportunities is Eventbrite. I use it personally for networking, workshops, and similar activities but there’s nothing stopping you from pitching a presentation. I searched for business events near me in the city of Toronto. Do you know how many results there are? 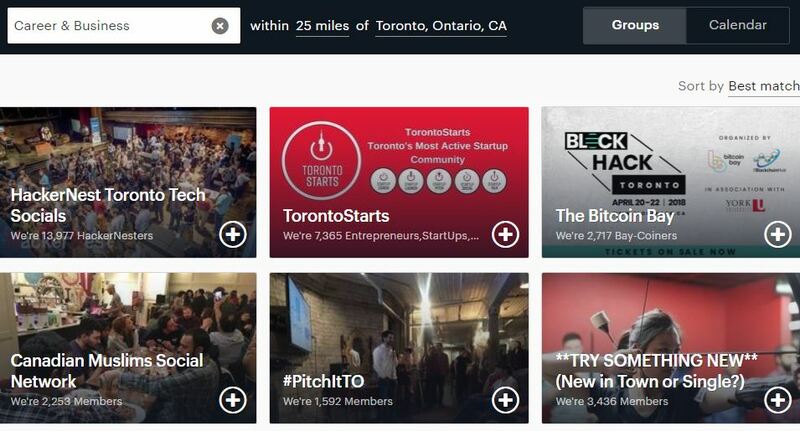 You will have no shortage of organizations and meetups to pitch. Put yourself in the shoes of your ideal client. They land on your website and see you’ve worked with reputable brands. This is great social proof and they can see the high quality service you’ve provided. It’s easily one of the most effective marketing strategies for consultants. Did you consult with a client and it helped them increase their revenue, team size, or another KPI? Turn that into a case study for future prospects to read. A case study is essentially an in-depth review of your service. It’s been proven that standard reviews boost conversion rates by 63% in some circumstances. 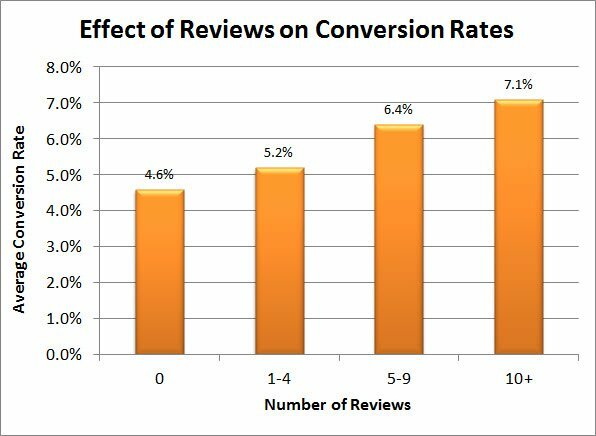 Capterra found that as reviews increase for your service or product, so does conversion rate. You’ll definitely want to include normal testimonials for this reason but case studies can be even more effective. You’ve probably tried this before. We all have, including myself. Many stop after receiving rejection emails or very little ROI. If you do it right, you can get clients through cold emailing, no problem. It’s an art you have to master. Firstly, it’s essential that you email them at the right time. The sweet spots are between 5AM to 6AM and 7PM to 9PM. A.K.A, when people get to work and when they’re home. Cold emailing is also very time effective. Think about how long it takes to call up businesses compared to sending them a personalized email. You can also set up a hone call afterwards, but this is a much faster way to get your foot in the door. How about the subject line? Surprisingly, there isn’t much of a middle-ground. Either very short or long subject lines tend to perform the best. Keep this in mind when emailing your prospects. Next up, the content length. Now that you know this, it’s time to craft your perfect outreach email. Remember that it’s best not to sell something right away, but rather propose an idea or question. Here’s a great template, thanks to Hubspot. 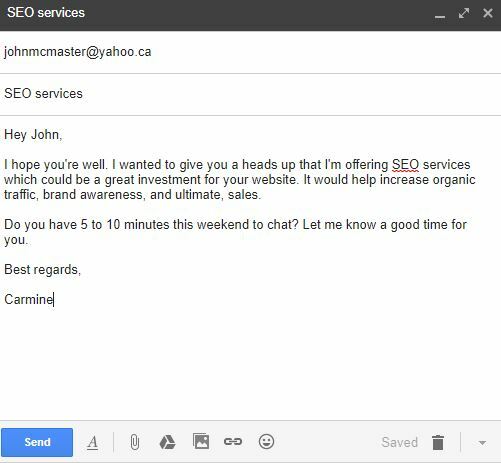 This template starts off by complimenting the prospect and referring their service to your contacts. So, you’re immediately offering value. Then, you propose a call to fix a small issue you found. Super simple, yet so effective. What is your favorite strategy for finding new clients?